Our weather here has been all over the place lately. Last week we had hail storms on Sunday and temperatures in the 90’s by Thursday. It’s tough to figure out what the day will bring and while it isn’t summer yet I thought I’d share one of my favorite dishes for when it’s too hot in the kitchen to contemplate cooking. You do need to boil some water to cook the soba but other than that everything is oven free. This is a great dish to make ahead and it keeps great in the fridge for 3-4 days so don’t be worried about the leftovers. 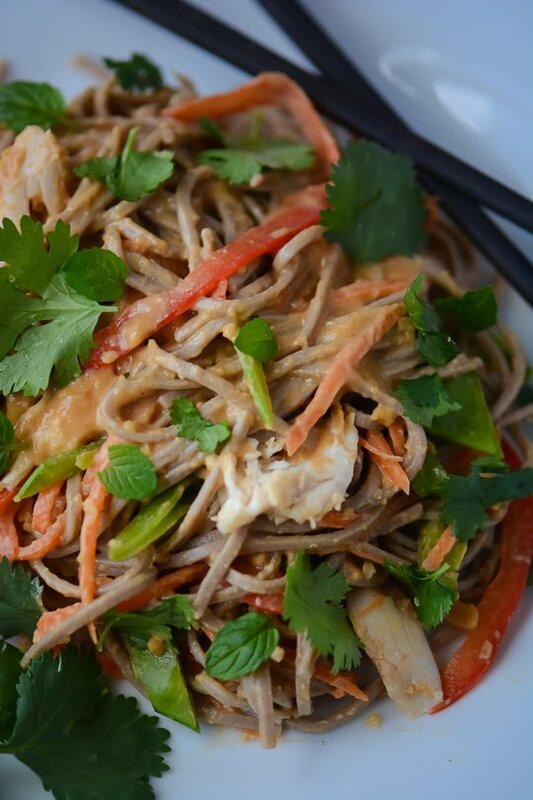 The base is a spicy peanut sauce mixed with a ton of fresh veggies and soba noodles. 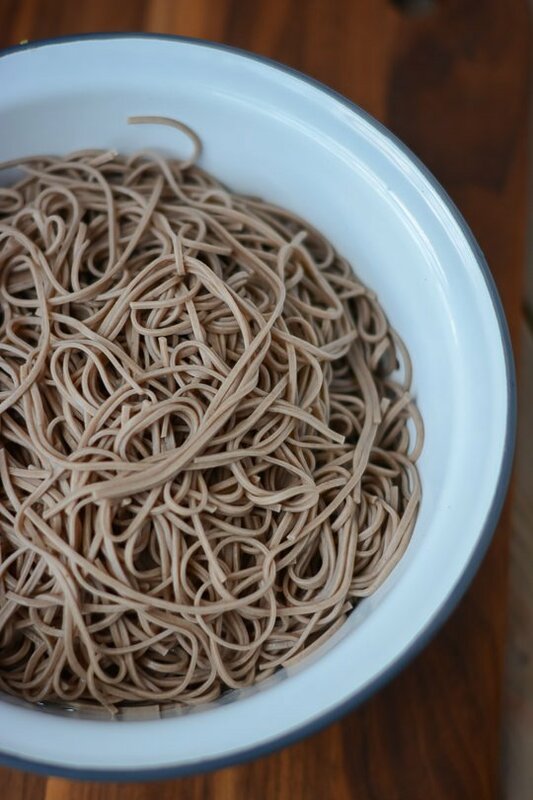 Don’t worry if you can’t find soba in your market, you can easily substitute spaghetti instead. I used carrots, bell peppers and snow peas here but feel free to mix up the vegetables you want to use. Red cabbage, asparagus and broccoli would all be great additions. If you want the dish to be vegetarian replace the chicken with some baked tofu or avocado. I’m off to work in the garden a bit before the rain starts again. Have a great day! 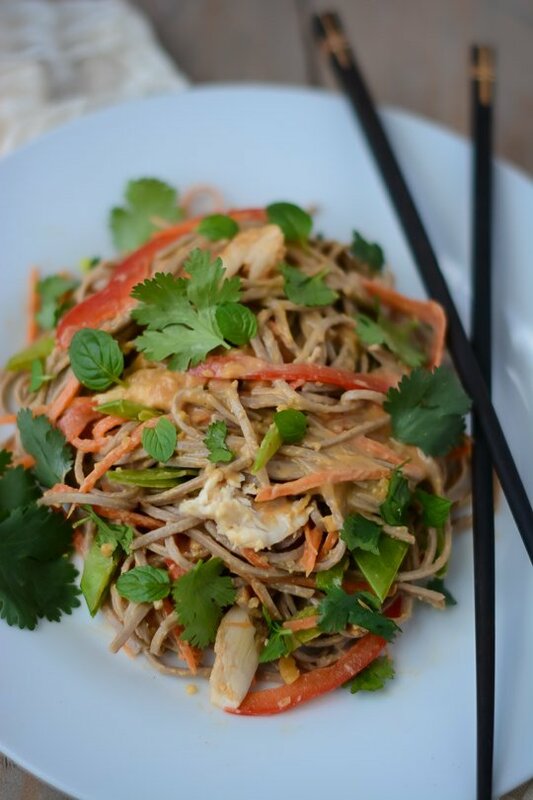 This spicy chicken peanut soba noodle salad is a great weeknight meal. It uses store bought rotisserie chicken to get dinner on the table in less than 30 minutes! For the dressing combine all the ingredients in a blender or food processor and process until smooth, adding a little more water if too thick. Cook the noodles according to directions. 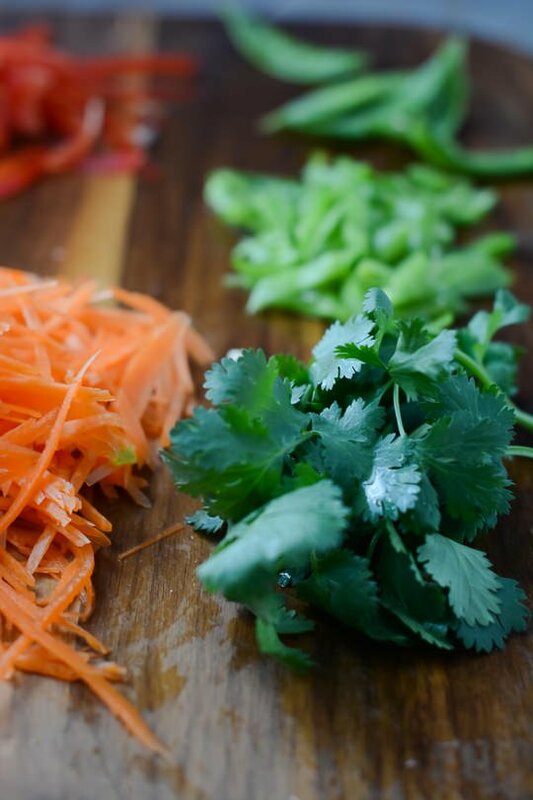 Drain well and toss with the chicken, vegetables, herbs and dressing. Garnish with the peanuts and additional herbs if desired. Serve the salad hot or cold. oh, delish! this looks like a keeper. Thank you! Beautiful colors and textures in this, I love soba noodles! These look yummy. 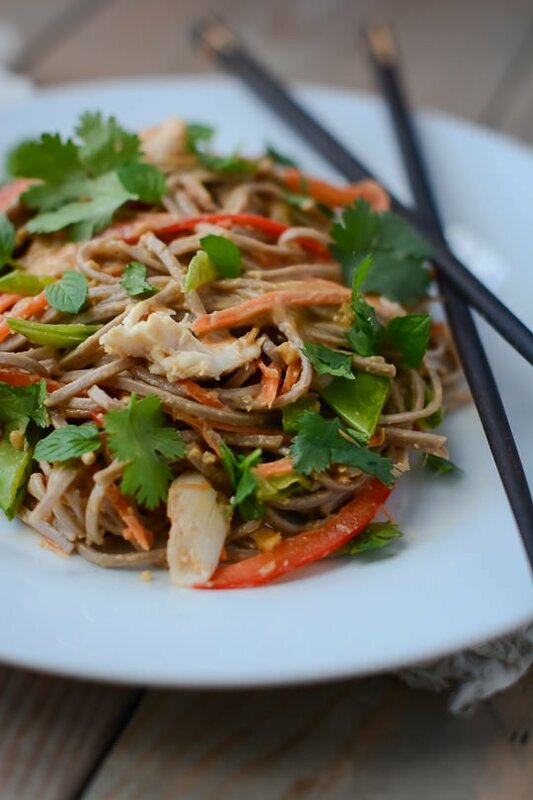 I enjoy a good peanut noodle recipe. 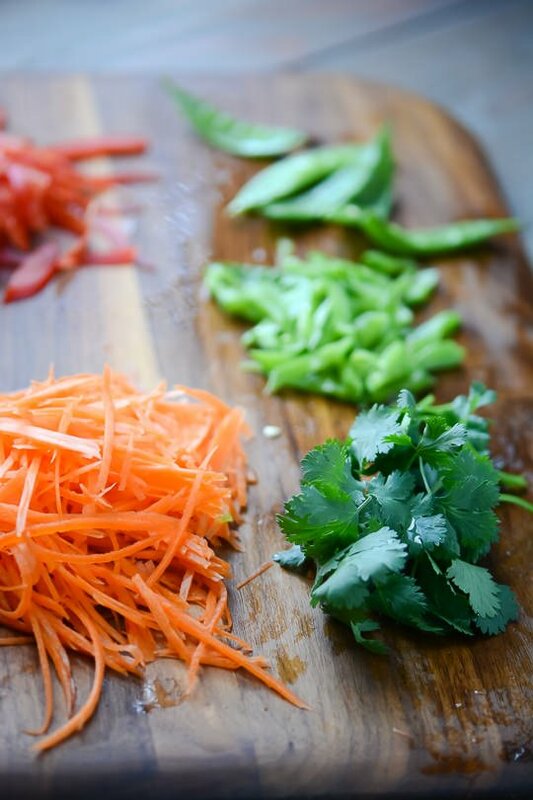 Your carrots are so uniform…what kind of slicer/mandoline are you using? When your cookbook is published, I expect a signed galley! Your food pictures are beautiful! So good to hear from you! I love the mandolin I’m using but you need to watch your fingers. I picked it up on Amazon for $25.00. I’ll email you a link. Hope you guys are doing well! I can almost taste the flavors in this dish. 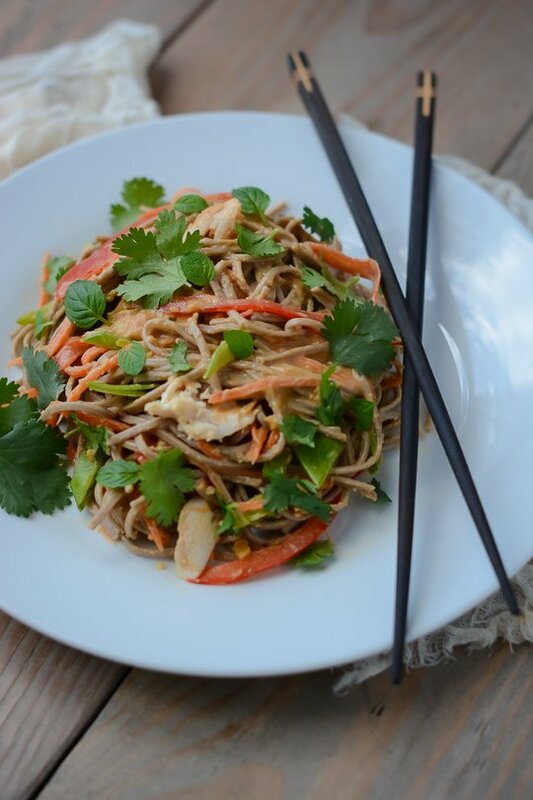 I love soba noodle salads like this and am always looking for more no-cook dishes for the summer months, so this is going on the to-make list!